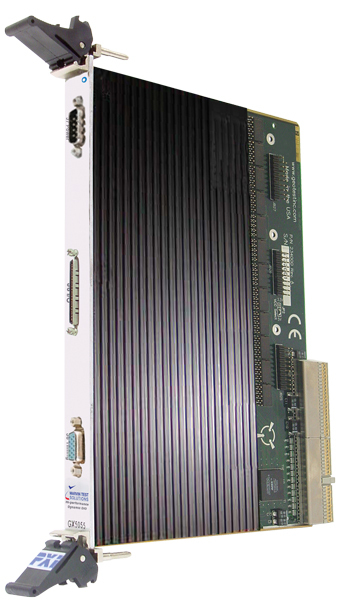 PXI Digital I/O Card, Dynamically Controlled - GX5055 | Marvin Test Solutions, Inc. The GX5055 offers real-time digital stimulus and capture with 32 pins per card. Each pin can be configured as an input or output on a per cycle basis. Six drive data formats are supported: NR, R1, R0, RZ, RC, CC – providing flexibility to create a variety of bus cycles and waveforms to test board and box level products. Each digital channel of the GX5055 includes a PMU for measuring a UUT’s DC characteristics. The PMU can operate in the force voltage / measure current or force current / measure voltage mode. An innovative, state-of-the-art algorithmic sequencer allows users to create loops and branches to manipulate the output vectors. All of the sequencer commands are available and may be programmed using the Graphical Vector Editor using Windows® API command or via a script language. The sequencer allows the user to generate test vectors indefinitely at maximum test rates. Internal and external trigger and pause commands are available in several modes. The GX5055 includes 5 banks of 512 k x 32 memory, supporting drive, sense, direction, control and data valid functionality for each channel. The GX5055 operates in any 6U PXI chassis that supports an air flow rate of 20 cfm / slot. Power for the pin electronics requires the use of external power supplies or the GX5055 can be used with a Marvin Test Solutions GX7005A PXI chassis which is designed for the GX5055 and includes the necessary pin electronics power supplies. Optionally, for low voltage applications, the GX5055 can be used with a GX7100A chassis and a GX7400A user power supply. This configuration supports up to three GX5055 cards. Optionally, DtifEasy is available for use with the GX5055. DtifEasy offers a complete LASAR post-processor and test execution environment for post-processing and execution of LASAR generated .tap files.